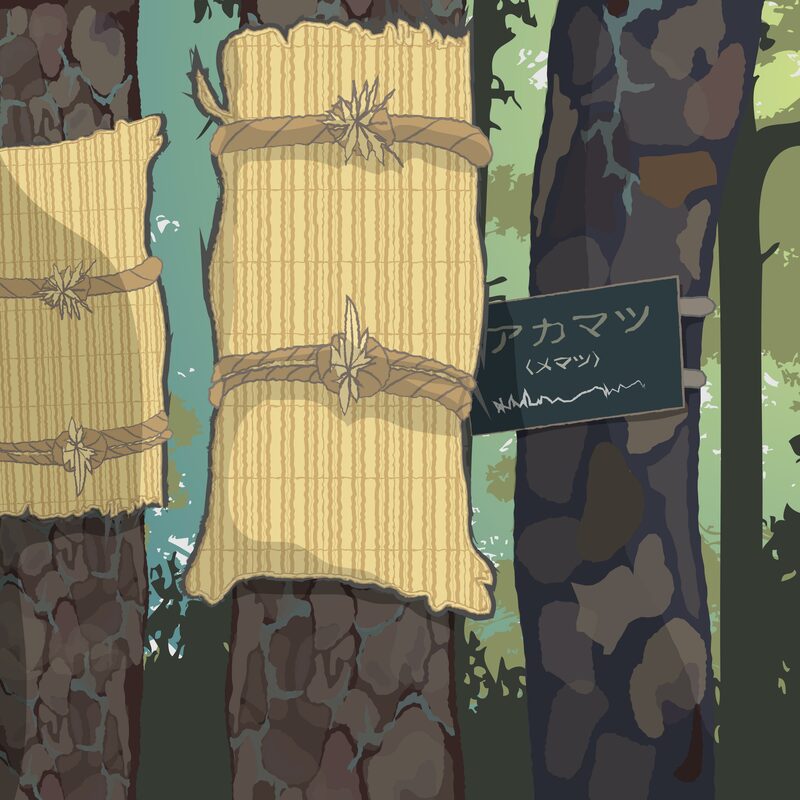 In early March, whilst out walking in a Tokyo park, Kiku and Miko-chan saw some gardeners removing straw matting that had been placed around the trunks of some pine trees – they looked a bit like the tree was wearing an obi belt, as around a kimono. When they got home they asked Boss Panda what they were, and he told Kiku to go and get the seasonal almanac, as it marked a particular event in the season. “Those rice straw mats are called komomaki, and are sometimes used to help minimise the damage made by a particular kind of insect – the hungry matsukareha caterpillar. The matsukareha is a type of pine moth found in Japan, Siberia and Korea (dendrolimus spectabilis), which normally hibernates down in the leaf litter for the winter. 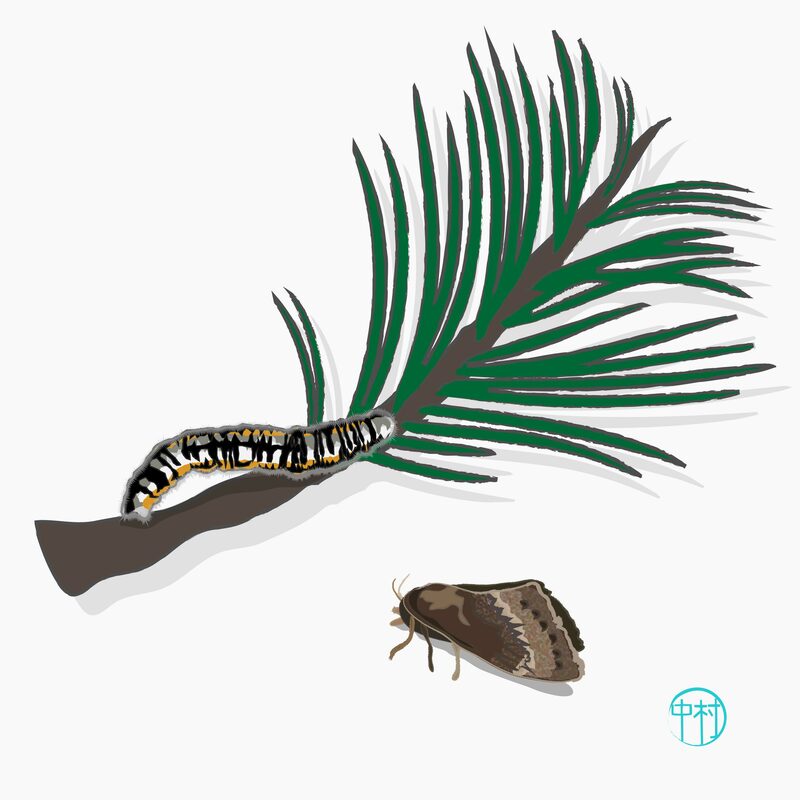 But when the caterpillars begin to wake up they have an insatiable appetite for pine needles and can cause incredible damage to the trees in a short period of time. To help combat this, the komomaki mats were developed during the Edo period (1603 – 1867) as an alternative hibernation spot as they make their way down to the leaf litter on the ground. Boss Panda pointed to a page in the almanac that described the sekki1 known as sōkō, or “frost descent”, and explained further, “the seasonal almanac plays an important part in their use – the mats are tied around the trees during this time which begins on 23rd October or on the day the almanac refers to as the ‘start of winter’ or ‘rittō’, on the 7th November. 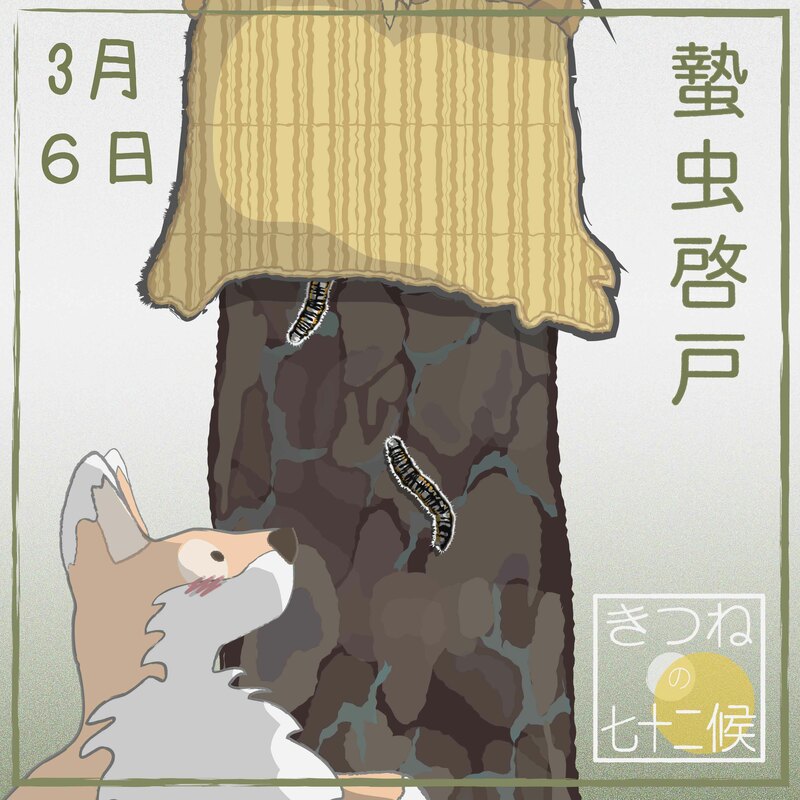 The mats then stay on the trees until the sekki in March called ‘keichitsu’, or ‘awakening of insects’ – which starts today with a five day micro season entitled ‘hibernating insects awaken’, or more poetically ‘hibernating insects open their doors’. 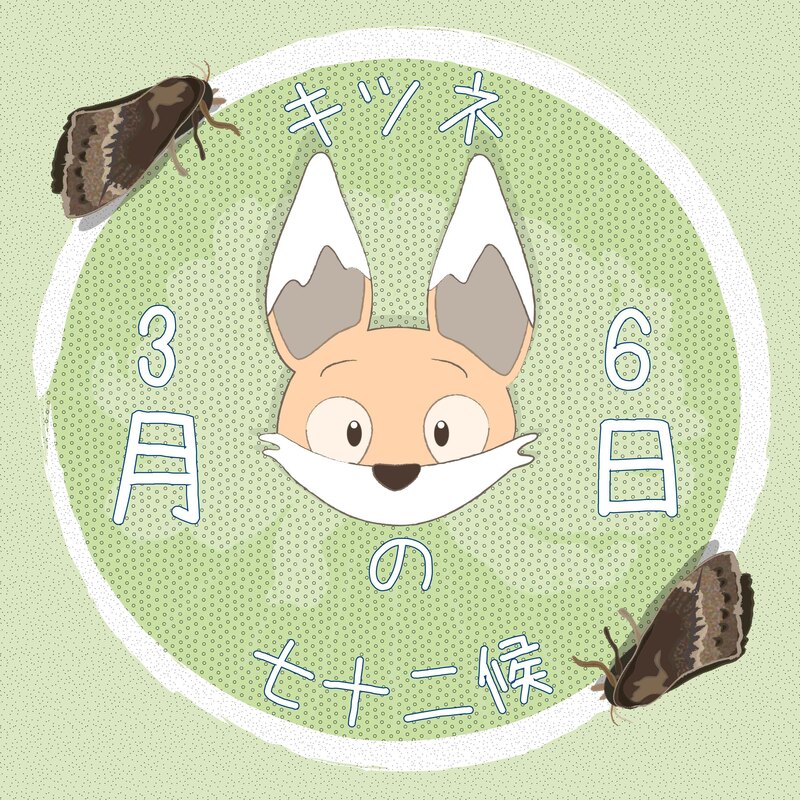 “At this time, the gardeners take down the komomaki and burn them with the pests still inside, thus tackling the insects without pesticides and using the ashes as fertiliser for the coming season”. Miko-chan looked a little sad “It is good that they don’t use chemicals, but I feel sorry for all those drowsy caterpillars coming to an end like that. It makes me want to shout and warn them!” Boss Panda smiled at the kindhearted little shrine maiden doll. “That sounds like a good starting point for a haiku”, he encouraged. Miko-chan thought this sounded like a good idea, and went off to compose one. 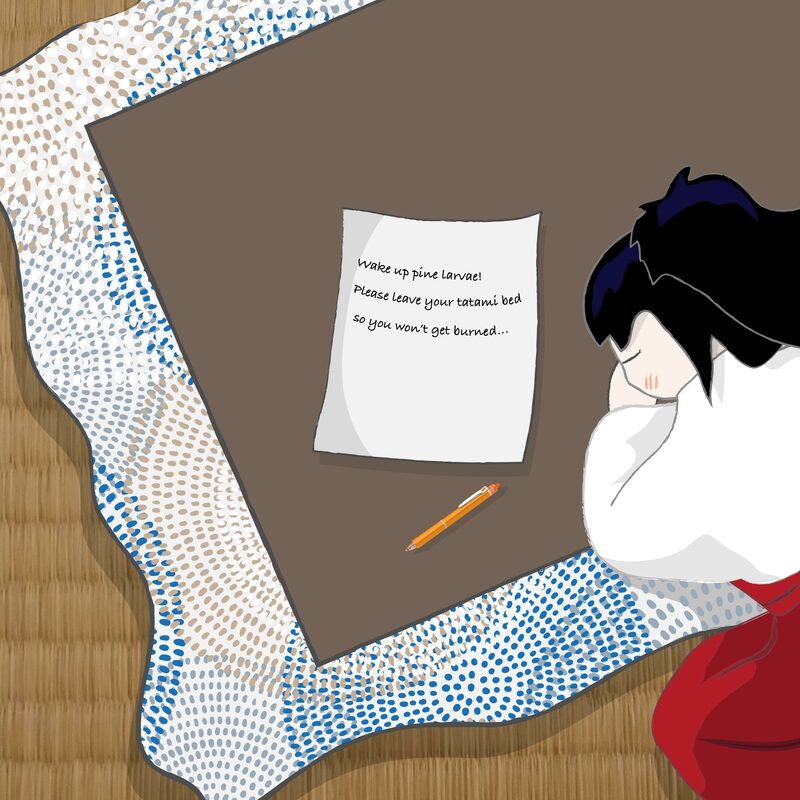 Kiku went off to tell Miko-chan not to worry because the decorative komomaki were not being used to trap and eliminate insects after all, and found her asleep at the kotatsu, with the following haiku she’d composed on the table top…. 2 Fūbutsushi is a word that is hard to translate into English, sort of meaning things which evoke poetic memories or the anticipation of a certain season. Another item which may elicit such a response in winter whether it snows or not is the yukitsuri (雪つり), or ‘snow hangers’: straw ropes that support branches preventing their breakage in case of heavy and wet snowfalls. Thanks Jennifer! Miko-chan cares for everything, she is a kind soul – and haiku is a good way to soothe the soul….